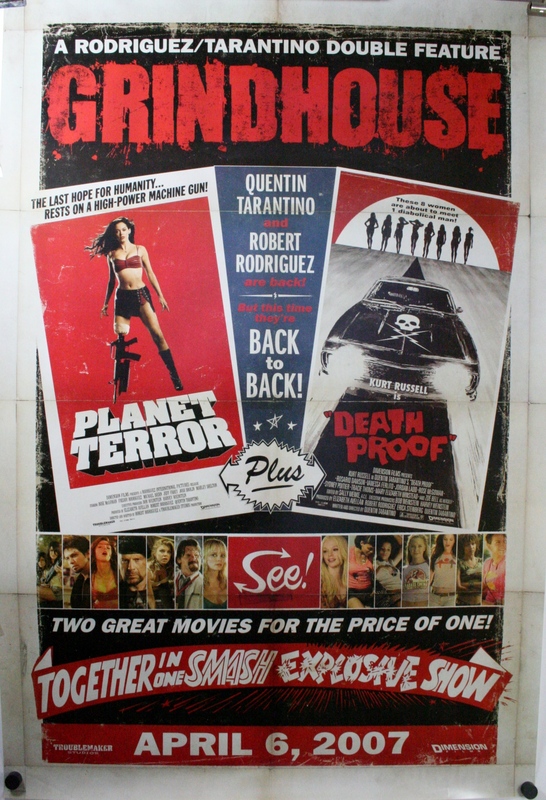 GRINDHOUSE Double Feature Planet Terror & Death Proof, 2007. Original double sided unfolded Advance US 1 Sheet (27 x 40 “) Classic Horror Zombie / Cool Car Movie Poster starring; Danny Trejo, Cheech Marin, Rose McGowan, Bruce Willis, Kurt Russel, Directors and Writers Robert Rodriguez and Quentin Tarantino. This double feature debut of Planet Terror and Death Proof is a modern re-creation of a style of films called Grindhouse from the 70s and early 80s. Typically two movies would be shown back to back at a drive-in movie theater. Double billing movie posters were designed for this market. This poster is made to look old and tattered. It is in fact not folded or worn at all. In fact this poster in near mint condition with no major or minor defects to speak of! Bid with confidence, this poster would look awesome in a media room or man cave!